Under Sleeper Pads (USP) are an economical way to mitigate troublesome vibrations arising from railway traffic. 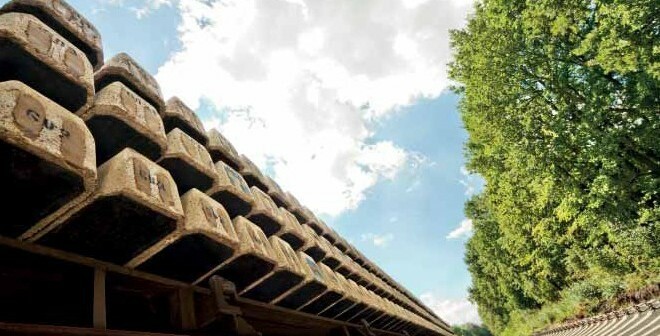 Using this type of elastic mounting, tracks stay not only more even and hollow areas underneath the sleepers are effectively avoided, but unwanted structure-borne noise can also be reduced. Efficiency and limits of this measure are discussed in detail in the following article. A moving train causes mechanical vibrations from the wheel/rail-contact. These vibrations (emission) are carried through the subsoil (transmission) and often perceived as annoying at the receiver (immission). The life quality of residents can be negatively affected to a considerable degree, particularly if the vibrations increase in occupied rooms because of the effect of resonance. Or if structure-borne noise arises as a result of higher frequency parts of the vibrations. The emitted structure-borne noise, which is also known as secondary airborne noise, can mostly be heard as a muffled rumbling sound inside the buildings. This sound can be eclipsed by the externally arising primary airborne noise from open stretches of track. The transmission paths are shown in Fig. 1. Noise and vibrations are an unpopular side effect of our mobility. Suitable measures must therefore be taken to preserve and enhance quality of life, particularly in fast-growing population centres. It is well known that it is most effective to concentrate on reducing annoying vibrations directly at the source of the emission. The quality of the railway superstructure has a considerable influence on the formation of vibrations. The more even the superstructure, the lower the power and parameter excitation when a train passes. The track itself is “floating” in regular ballasted superstructures. Repeated static and dynamic loads lead to changes in the track geometry over time. The deviations from the intended layout arising in the track geometry lead to additional acceleration of the wheel sets. The forces of mass that occur further alter the track bed quality. Hollow areas below the sleepers and wear on the rail surface, both of which arise over time, increase these processes – as well as being the result of them. The system swings more and more, thereby also increasing the emissions. By tamping and adjusting, the superstructure must be returned back to its original position. The time progress of this deterioration is largely dependent on the initial quality of the track superstructure . The creation of the conditions necessary for a good superstructure that is as inherently stable as possible should therefore be the primary target when installing new tracks. In this context, evenness and resilience are important starting points for a high-quality system. Through the defined arrangement of elastic elements, the superstructure can be brought closer to achieving this goal. Using USP can therefore be an appropriate option. 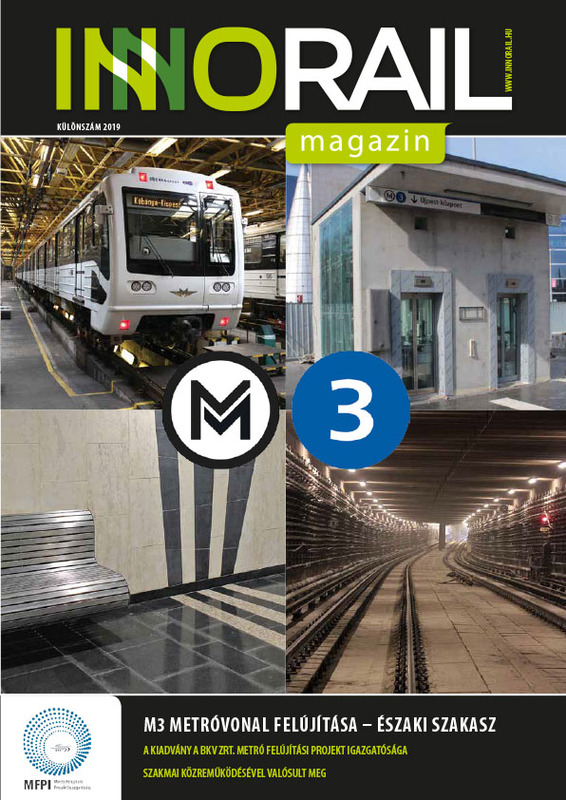 In recent years, the use of USP has been promoted in European railway companies by various fields of interest. The main aim is the improvement of the track bed geometry and long-term protection of the ballast. 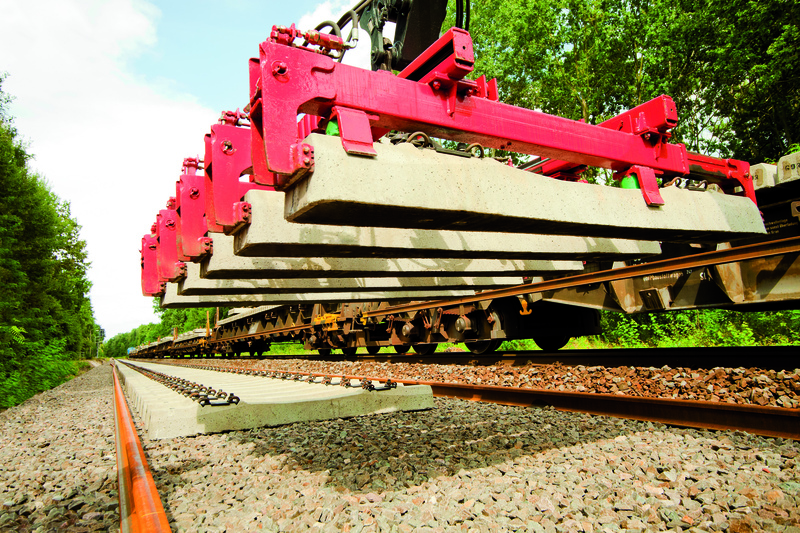 Arranging the elastic material under the concrete sleepers prevents a hard interface directly to the ballast. The upper-most layer of ballast can bed into the padding material, increasing the surface area (from 2-8% without USP, up to 30-35% with USP) and thereby also avoiding excessive contact tensions. The larger ballast surface area and the more even bedding lead to an increased stability of the ballast bed, less track settlement and reduced wear to significant track components. With USP, these positive effects can be demonstrated, both theoretically and in practice: as laboratory tests and track measurements show, the lateral resistance of padded sleepers is consistently higher than that of conventional concrete sleepers. With elastic USP of lower stiffness, a further increase in lateral resistance was measured as a result of the ballast grain bedding in deeper compared to hard USP . 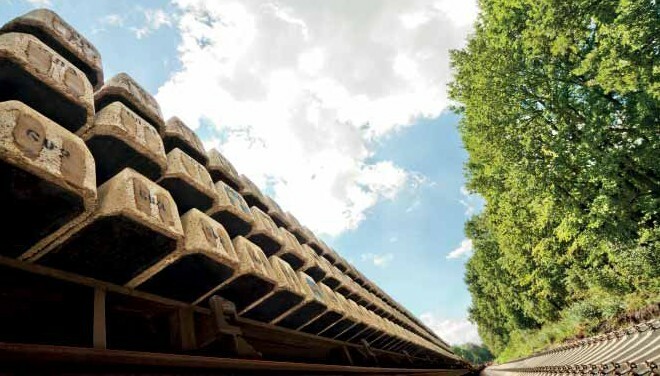 Particular in ballasted superstructures, hollow area formation is almost completely avoided and this fact in particular also shows that the concrete sleepers have a significantly better position behaviour. For example, while fairly strongly pronounced hollow areas arose over time between the undersides of the sleepers and the ballast bed in 7 out of 10 unpadded concrete sleepers in the rail network of the Austrian Federal Railways, no hollow area formation could be detected in the measured sections with USP  (cf. Fig. 2). Deviation in the track bed geometry is significantly lower in padded sections than in unpadded sections. These properties have led to USP bringing about a significant improvement in the traditional ballast superstructure. Not least because of this, sleeper padding has established itself as the standard form of construction in the Austrian Federal Railways’ network. In the mainline network today, concrete sleepers with USP are used as standard in new construction of regular tracks and turnouts. A railway track with excellent, long-time track bed behaviour due to USP emits less noise and vibrations thanks to the trains running more smoothly. The use of highly elastic materials can significantly reduce emissions to the surrounding environment by making use of the physical principle of vibration insulation. The efficiency of an elastic component in the track superstructure is dependent on the influencing variables of mass m, stiffness c, and damping D. A vibratory system is formed, the natural frequency of which is ideally far lower than the insulating excitation frequency, based on the operating principle of a single/multiple degree of freedom systems. Sylomer® and Sylodyn® have proven themselves as essential elastic components for the reduction of emissions (Fig.3). Depending on the requirements, the USP can be provided with a more or less pronounced damping component, especially for avoiding excessively high peaks (resonance) in the vicinity of the natural frequency. With a dynamic stiffness that can be accurately adjusted for any application, USP can be used to its full capacity for track vibration insulation. As a rule, the higher the dynamic efficiency achieved through the chosen Polyurethane material (PU), the greater the vibration protection performance. The vibration-reducing mode of elastic elements is quantified by the so-called insertion loss in accordance with the standard . The insertion loss describes the relative effect of a mitigation measure compared with a reference situation. It e.g. shows how the 1/3-octave-band spectrum of structure-borne noise changes if USP are installed. Ideally, all other emission influences remain constant here, i.e. the same vehicle, the same speed and identical rail roughness, etc. are considered. As the elastic element influences the railway system as a whole, the frequency-dependent insertion loss may vary with other track superstructure properties, other subgrade properties and/or other vehicle fittings. Fig. 4 shows a series of measured insertion loss curves on different railway lines with various USP made from Polyurethane material. As can be seen from the measured insertion loss curves, the natural frequencies of the superstructures with USP generally lie between 30 – 40 Hz. In the range relevant for emitted structure-borne noise, above 50 Hz (secondary airborne noise constitutes the decisive criterion here) the insulation efficiency ranges between approx. 4-14 dB (63 Hz) across all types of USP. With regular elastic USP 4-7 dB are attainable values. Compared with this, there are the highly-elastic USP, which should be considered particularly in conjunction with structure-borne noise insulation. They demonstrate the potential of the technology in an exemplary manner: with a ballast superstructure optimised acoustically in this way, maximum damping efficiencies of 11-14 dB can be achieved (63 Hz)! Measurements prove the performance of these types of USP that significantly exceeded expectations. For ease of understanding: 10 dB already corresponds to an insulation rate (reduction) of 69%. With frequencies below 50 Hz there is hardly any amplification (-1 to -3 dB), whilst below 25 Hz a further reduction of up to 2 – 8 dB is apparent. This is probably largely due to the better bedding of the sleepers in the ballast (fully embedded, no sleeper hollowness). A lowered efficiency that vibration insulation theory leads us to expect occurs at 100-160 Hz (influence of soft rail pads). Nevertheless, it almost always remains a positive effect (reduction) without the feared amplification effect. The above findings regarding insertion loss should be sufficient to prove the fundamental suitability of USP for reducing vibrations and secondary airborne noise. However, selecting the correct system is vital. 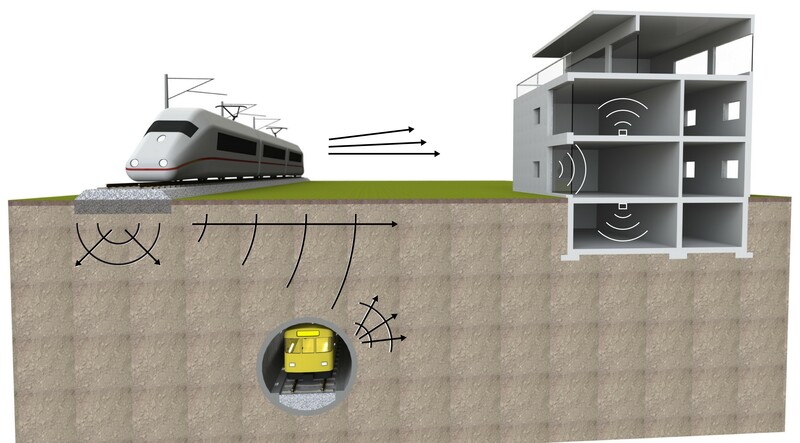 This applies both to USP on open tracks and those in tunnels (Fig. 5). The above findings from track measurements (Fig. 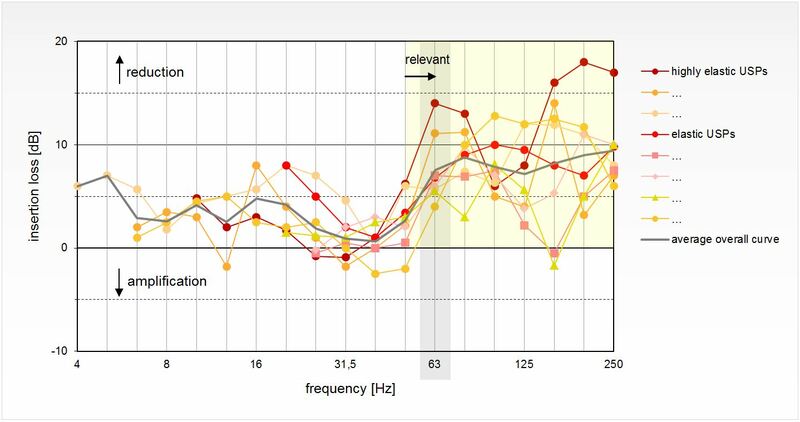 4) show the frequency-dependent effect of USP. One relatively simple option for mathematically forecasting such a vibration mitigation performance is the impedance model [4, 5, 6]. Originally designed for ballast mats, this model can in principle also be used for calculations involving USP. The insertion loss also indicates here the ratio of the vibration velocity amplitudes in the ground, without elastic components, to the amplitudes in the ground with elastic components installed. In addition to the spring impedance of the elastic material, the terminating impedance of the subgrade is taken into account – with a softer subgrade in the frequency range > 125 Hz this can typically lead to a declining curve with a decreased effect in the 1/3-octave-band spectrum (cf. fig. 6: Impedance Model – left-hand diagram). A possible reduction in the damping efficiency at 100-160 Hz with the existing of soft rail pads is not being shown. Similarly, the positive mode of operation frequently determined in the measurements for the frequency range < 25 Hz, due to the improved track bed using USP, could not be seen. One possibility for better reflecting the behaviour measured in the track with a forecast model would be to use a “semi-empirical” approach. A model partly based on empirical values – using multiple ranges, could more closely describe the reality (cf. Fig. 6: ‘Semi-Empirical’ Approach – right-hand diagram à Range 1: Offset for improved track bed quality. Range 2: Analytical Model considering the alleviative influence of soft rail pads if present. Range 3: Optional declining curve taking in account e.g. the decreasing effect due to the influence of the subgrade). It must be noted that use of such an empirical approach may, under certain circumstances, require more in-situ measurements, in order to enable further accurate statements in future concerning the mode of USP operations with regard to vibration protection. This is intended merely to provide food for thought here, however it is highly probable that the accuracy of a forecast concerning USP could be improved by using empirical data. 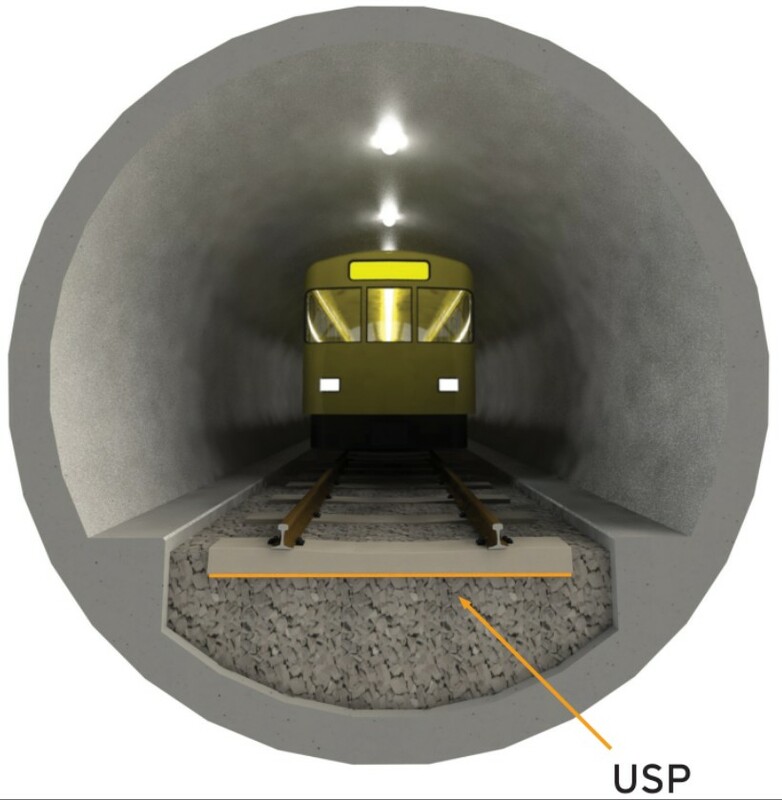 As measurements have shown, the installation of USP has no significant impact on the emission of primary airborne noise from the track superstructure. Although a short-term increase amounting to a maximum of +5 dB within the frequency range 50-100 Hz must be expected directly following installation, this is offset by a reduction of up to -5 dB in primary airborne noise within the higher frequency spectrum above 100 Hz . In this type of comparison, a new track without USP is generally used as reference. It must always be borne in mind that the track bed deteriorates much more quickly, comparatively speaking, in tracks without USP, whilst local individual faults (e.g. hollow sleepers) and/or surface flaws in the rail (e.g. corrugation on the inner rail in narrow curves) also arise. Such deteriorations in track quality may lead to a huge increase in airborne noise. 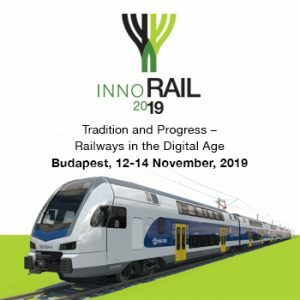 For example, rails with short-pitch corrugation may result in an increase of more than +15 dB in the noise level when they are traversed by trains. The improved long-term quality of tracks with USP has been proven. Consequently, a short-term direct influence on primary airborne noise appears negligible. However, further measurements must still be carried out with regard to this topic. Nowadays, USP that are predominantly used to improve the track bed geometry and ballast deterioration consist of a resistant material with a visco-plastic property, allowing the ballast grain to be embedded properly. On the other hand, USP that are primarily used for vibration insulation require a softer, dynamically highly-elastic material with low damping properties. As the explanations in this article show, both approaches are necessary for effective vibration protection. Therefore a combination of different materials may be used in order to reduce the occurrence of the disruptive vibrations by means of a stable and safe track bed geometry, whilst also reducing the transmission of said vibrations using the physical principle of vibration insulation. Fig. 7 shows USP in a sandwich arrangement with multiple functional layers. The soft and acoustically highly-effective elastic layer made from Sylodyn® is protectively embedded between a connecting medium (“mechanical adhesion” mesh) for the sleeper concrete side and a visco-plastic layer for the ballast side. This separation of functions covers multiple aspects and can therefore also cater to these types of combined requirements. 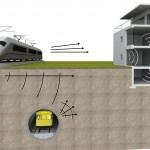 Moving trains generate mechanical vibrations that are transmitted either as structure-borne noise through the ground or as airborne noise. According to current knowledge, USP made from Sylomer® or Sylodyn® can be used to reduce the vibrations within the frequency range relevant to structure-borne noise by more than 10 dB. A significant impact on primary airborne noise has not been established. Consequently, technically-optimised USP can represent an economical improvement on the traditional track superstructure as far as vibration protection is concerned. The choice of material used for USP is of vital importance. It is not yet possible to generalise from the statements that have been made. Further research into this topic will be required.